[CONFSERVER-38277] Confluence Page gadget throws "The resource rest/webResources/1.0/resources, cannot be found." 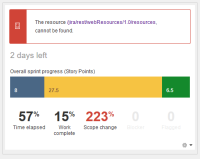 error - Create and track feature requests for Atlassian products. Observe that there is no error message displayed. After creating an application link between JIRA and Confluence, have JIRA subscribe to Confluence gadget and add the Confluence Page Gadget to a JIRA dashboard. You will see the following error in it. If JIRA and Confluence URLs do not have a context path, the error doesn't appear.